It has been nearly 3 months since the surgery to remove the precancerous area on my tongue. My surgeon recommended that I have follow-up appointments every three months. Since it is obviously not feasible to fly to Atlanta four times a year just for a check-up,I found a doctor here willing to oversee my quarterly check-ups. He is an American dentist who has experience in tracking dysplasia in his patients, and He works here in Jinja! Today I drove into town to see him for my first visit. He took time to carefully examine my tongue, making several notes as he measure and photographed the area where the surgery was done. I felt like he was very thorough and told me that he will monitor and see if anything changes over time. He also said that he did not see anything that looked concerning today. Praise God! My appointment today put my mind at ease quite a bit. Many have asked how my tongue is healing. The incision has healed, but I still have a lot of nerve issues. It basically feels like pins all along the side of my tongue. My tongue also gets tired and by the end of the day it feels worn out. I still have a slight lisp, but if I speak slowly and carefully I can speak pretty clearly. I don't know if I will ever be able to read Fox in Socks, but that is ok. I also still need to drink quite a bit of water to clear food out of my mouth when eating. You don't realize how much you use your tongue to move food around until it is hard to do. But for the most part my tongue is fully functional. This ongoing issue with my tongue is a daily opportunity to depend on God or to live in fear and anxiety. By God's grace, he has given me more days of trusting him with my future than times of living in fear. I am thankful for this grace, but the struggle is by no means over. One of the blessings of this struggle is how it has helped me think about what is important in life. I want to spend my life doing things that matter for eternity. None of us know what God has for us tomorrow. I am so blessed to have the opportunity to live and work in a place where I see God's work in tangible ways in the lives of those around me. Seeing God's redemption in the lives of these children, physically, emotionally and spiritually is an amazing privilege. 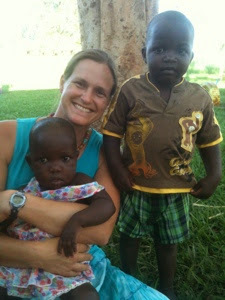 This afternoon I got to hug on these two precious children, Pinto and Moses.